The signing of Corentin Tolisso continues a proud tradition at Bayern Munich of French talent crossing the border to ply their trade in the Bundesliga. The midfielder will become the seventh Frenchman to turn out for Germany’s record champions when he makes his debut, with his countrymen before him having already made a combined 1,049 appearances in the famous red. When Munich and France combine, it simply seems to breed success. Download the free, official Bundesliga app by clicking right here! Wind back the clock to 30 August 1995 and Markus Babbel sends a cross into the Uerdingen penalty area during a Bundesliga match at Munich’s Olympiastadion. The ball is met by Jean-Pierre Papin, the first Frenchman to don a Bayern shirt, who fires it past goalkeeper Bernd Dreher with a sideways scissor-kick. Although Papin’s two seasons in the Bundesliga were not as successful as had been hoped, the Frenchman’s fine finish on Matchday 3 of 1995/96 was chosen as goal of the season. The term "papinade" entered the French language as a way of describing a sideways scissor-kick similar to that smashed home by Papin. A year after Papin’s 1996 departure, Bixente Lizarazu pitched up in the Bavarian capital. At 27, the left-back was already vastly experienced, having won international caps for Les Bleus and played at Athletic Bilbao and Bordeaux, where he turned out alongside Zinedine Zidane. Lizarazu came up against his future employers with Les Girondins in the final of the 1996 UEFA Cup, when he came off second best. However, the titles would soon follow in Munich, where Lizarazu won the Bundesliga six times, the DFB Cup five times, the League Cup four times, as well as the UEFA Champions League and Intercontinental Cup once apiece during a decade-long spell with Bayern. The defender also won the 1998 FIFA World Cup and UEFA EURO 2000 with France during his time in Bavaria. Chapeau, Liza, as they say in France. Despite turning 34 in April, the left winger still provided five goals and 11 further assists from his 22 Bundesliga appearances last term. He also chipped in with seven more assists from just nine games in the Champions League and DFB Cup. 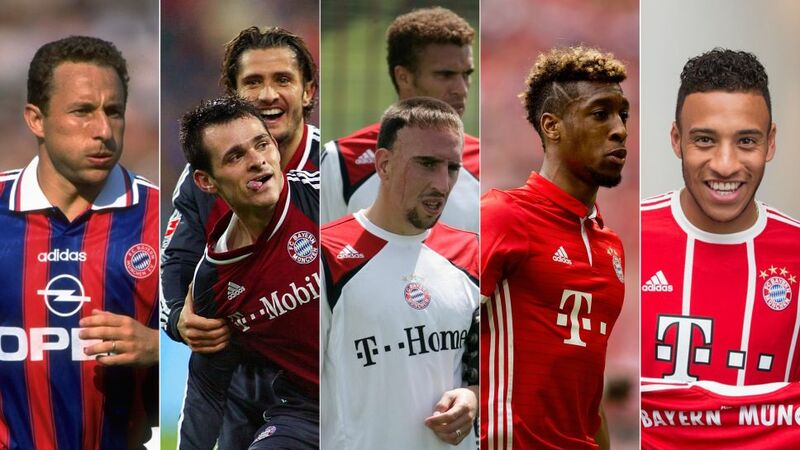 Ribery is one of the leading names from a generation of Bayern players that has brought unrivalled success, including the 2013 treble, standing tall alongside the likes of Philipp Lahm, Bastian Schweinsteiger and Arjen Robben. Another French winger, Kingsley Coman, arrived at the Allianz Arena two seasons ago at just 19, while latest signing Tolisso is only 22. The Gallic duo are the sixth and seventh players from Germany’s western neighbour to sign for Bayern, and are following in some giant footsteps. Both highly regarded around the world in their respective positions, Coman and Tolisso are set to play a part in further success at the record champions in the short, medium and long-term. The upcoming campaign could be key for Coman in making his breakthrough. The winger provided a combined 18 goals and assists in all competitions during his debut season under Pep Guardiola, but managed just three in 2016/17. He was only on loan at Bayern for those two seasons from Juventus, but the German record champions have shown faith in the youngster, who already boasts a remarkable five league titles to his name, and signed him on a permanent basis.